Manhattan District Attorney Cyrus R. Vance, Jr., today announced the sentencing of ELLIOT MORALES, 36, to 40 years-to-life in state prison for the hate crime murder of 32-year-old Mark Carson in Greenwich Village in 2013. On March 9, 2016, the defendant was convicted by a New York State Supreme Court jury of all the charges in the indictment against him, including Murder in the Second Degree as a Hate Crime, Criminal Possession of a Weapon in the Second and Third Degrees, Menacing a Police Officer, and Menacing in the Second Degree. As proven at trial, late in the evening on May 17, 2013, MORALES urinated outside of a restaurant on Barrow Street in Greenwich Village. After an employee of the restaurant rebuked the defendant, MORALES followed the employee into the restaurant, approached several individuals at the restaurant’s bar, and made threatening remarks while displaying a .38-caliber revolver. Shortly thereafter, just after midnight in the early morning hours of May 18, MORALES left the restaurant and passed Mark Carson and another man – Carson’s childhood best friend – on the street near Sixth Avenue and West 8th Street. As he passed the pair, the defendant made homophobic comments. After the pair walked around the corner on to West 8th Street, the defendant yelled additional anti-gay slurs at them. Near the corner, MORALES removed a .38 Taurus revolver, pointed it at the victim, and shot the victim once in the face, causing the victim to suffer fatal brain damage. MORALES fled the scene. Minutes later, he was identified by an NYPD officer on West 3rd Street, who ordered MORALES to stop. Instead, the defendant crouched down, withdrew the same handgun he had used earlier in the evening, and pointed it at the officer, who bravely subdued MORALES when the defendant momentarily fumbled his gun. 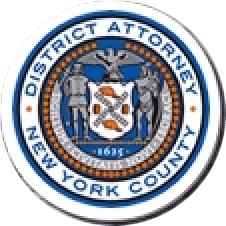 Assistant District Attorneys Shannon Lucey and Peter Casolaro handled the prosecution of the case, under the supervision of Executive Assistant District Attorney John Irwin, Chief of the Trial Division. Assistant District Attorney Joan Illuzzi, Special Counsel to the District Attorney, provided additional assistance with the case.